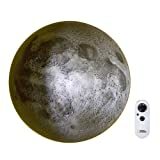 Moon in my room – $39 – This light up moon hangs on your wall and shows the moon in 12 different settings, controlled by an infrared remote control. An audio CD tells more about the moon. Planisphere watch – $59.95 – This watch glows in the dark for 2-3 hours. It’s a great present for the astronomy geek who always wants to take advantage of a dark night sky. The watch shows northern constellations only. 4. Orion Star Target Planisphere ” target=”_blank”>Orion Star Target Planishere – $11.00 – This stargazing the old fashioned way, with a map of the heavens you hold up in the night sky. You’ll also need a red flashlight to read the map in the dark. Barska Travel Telescope – 59.95 – Savings priced telescope for aspiring astronomers with 300X magnification and a 5×24 finder scope. Don’t expect the world, but this is a good intro telescope. Minor to major inconvenience is the table level telescope. It’s perfect for setting up on a picnic table and taking turns looking from there, but impossible to use at ground level.